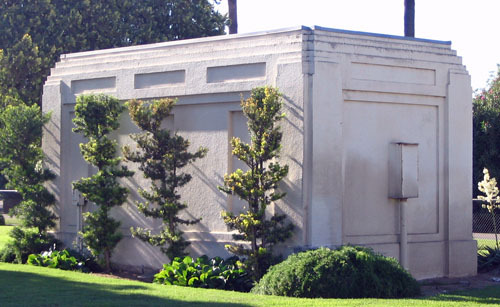 This rectangular plan building appears to be poured in place concrete and is Art Deco in design. Exterior ornamentation includes pilasters at each elevation corner that step back prior to the coping at the edge of the flat roof. Both the south and north elevations have three rectangular inserts that are similar in shape and scale to the windows on the bathroom building directly across the road. In this case the panels are solid, with no piercing. There is a solid panel door on the east elevation.